Two weeks ago, I returned to Plaza Latina with two friends, one of which has accompanied meow both my previous visits; and the other, a friend who I’ve mentioned how great this place was. This time around, I had to try Chilango Taco, the Mexican food stall. I ordered the Chorizo Tacos ($11.50) and Horchata ($4.50) to drink. The Horchata was served in a big styrofoam cup. It was very refreshing, but also a little bit of an acquired taste for those who haven’t had it before. 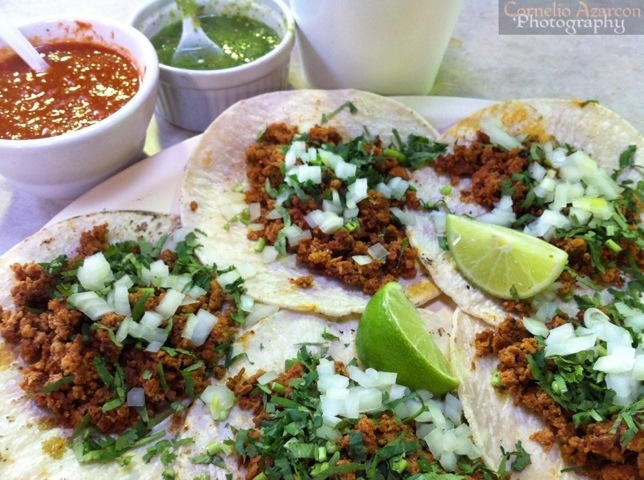 As for the tacos, each order comes with 5 pieces and are served with salsa and salsa verde. The chorizo tacos were served on a soft shell tortilla, and topped with onions and cilantro, and a couple of lime wedges on the side. The flavours awesome! It felt like a fiesta and you can’t help but want more. Hands down the best tacos i’veever tasted. The salsa verde adds a nice punch to the meal, especially if you’re a fan of spicy food. As usual, when I’m at Plaza Latina, I have to visit 2 food stalls. Where to next? tacos de choriza all the way bro!